"Great camp and the staff were awesome." "Workshops great, a really well run camp, thanks to everyone, see you next year." "Staff super friendly and a great environment"
"A wonderful experience for learning and for fun"
"Thank you ever so much to all the volunteers, musicians, dancers and organisers for this unforgettable experience"
This has been a truly wonderful weekend. So much to take home, new music and new friends. Thanks to everybody and see you next year." Our seventh festival saw a return after a couple of years break and we welcomed new teachers: Nawarra, Abdelkader Saadoun, Stephi Briggs, Elvin Herrick, Sacha Tremain, Angela Noble and Asif Qu along with regulars Michelle Pender, Carmen Jones, Russell Harris, Sevilay Turlington, Bland Mahdi, Maren Lueg and Chas Whitaker. Nawarra shared her extensive knowledge and passion for North African dance covering Rai, Chaabi, Moroccan Pop and many more. Abdelkader taught the melody players several popular North African songs as well teaching the singers the lyrics and explaining their meaning. He also ran drumming workshops introducing the traditional rhythms and drums and percussion from the Maghreb. Stephi Briggs taught her Drum Solo choreography to the dancers accompanied by Elvin Herrick who in turn taught the drummers the drum routine. Bland taught several Arabic and Kurdish songs accompanying them with Oud and Violin. Sacha Tremain taught Turkish dance to 9/8 rhythm assisted with live musical performance by the Hazir Ensemble and Sevi who in turn taught the singers the song. Maren ran introductory workshops for Arabic and Turkish Ney and Russell introduced the Arabic Oud as well as covering intermediate levels. Carmen taught her "Enchantress Dance" from her Club Cairo tour and Michelle taught her Gypsy Doodle workshop inspired by Tribal dance. Chas taught his popular introduction and intermediate workshops for general Middle Eastern percussion as well as a playing rhythms to Melody with melodic support from Maren. Sevilay Ataseven Turlington taught several popular Turkish songs for her singing workshops ably assisted by the Hazir Ensemble. Asif Qu taught the drummers the concepts of drumming in sets of 4 as well as Ornamentation and Separation of Senses. Angela Noble introduced the dancers to ATS Belly Dance focusing on the Fat Chance Bellydance format. Performances were by Abdelkader Saadoun, Hazir Ensemble, Chai For All and Mazaj. Many thanks to our Festival Photographer: Jeremy Rowntree. Our sixth festival welcomed new teachers: Liza Wedgewood, Adam Warne, Al Zaytouna and the O’Connell Family along with regulars Michelle Pender, Carmen Jones, Russell Harris, Sevilay Turlington, Maren Lueg and Chas Whitaker. Al Zaytouna shared their knowledge and passion for Dabke; the traditional Arab folk dance found primarily across the Levant region in the Middle East. Liza introduced the essence of Egyptian Shaabi and Ghawazee dance styles as well as improvising to the lyric flow of Classical Arabic music; played live by Chas and Maren. Michelle taught a group dance workshop based on Egyptian Bedouin culture with live musical support from accompanying drummers. Carmen shared her recently acquired knowledge of the latest hot new steps from Cairo to complete an eclectic dance workshop programme. Multi talented family - The O’Connells, brought a wide variety and wealth of knowledge from across Armenian, Jewish, Balkan, Roma and Ladino traditions, which created our interconnected workshops theme for this year. Kate’s singing workshops featured a mix of songs which husband Rory and son Liam taught in their musical ensemble workshops. Adam Warne ( aka Rhythmic Ginger ) brought his extensive knowledge of Frame Drums to the festival focusing on interlocking rhythms for ensemble playing and introducing the Egyptian Riq. Chas taught his popular introduction and intermediate workshops for general Middle Eastern percussion as well as a Dabke rhythms workshop to compliment Al Zaytounas classes. Maren ran introductory workshops for Arabic and Turkish Ney and Russell introduced the Arabic Oud as well as covering intermediate levels. Sevilay Ataseven Turlington returned to teach more popular Turkish songs for her singing workshops ably assisted with the musical talents of Simon Leach and Jo Levine. Performances were by Ensemble Baklava, Souk Bab el Louk and Mazaj. Middle Eastern Music and Dance Festival 2014 - Sunday Performance - Sa O Roma from Jeremy Rowntree on Vimeo. Middle Eastern Music and Dance Festival 2014 - Sunday Performance - Heyamo from Jeremy Rowntree on Vimeo. Middle Eastern Music and Dance Festival 2014 - Sunday Performance - Daronee from Jeremy Rowntree on Vimeo. Our fifth festival had Lamabada Yathathana ( and general Muwashahat and Sammai music ) as the subject for the Themed workshops and the melody was taught by Maren, Rhythmic arrangement by Chas and Choreography by Carmen Jones. Our special guests came all the way from California; Ling and Mark Bell from the legendary band HELM. Ling taught a Balkan Line Dancing, Melody, Singing And Zills Workshop and a Dancing, Singing And Zills To Helm's Muisc Workshop. She was ably assisted by the wonderful Hannah Mi who also ran her own workshops covering Turkish Roman and Trance. Mark Bell ran a Playing Arabic Rhythms ( 2/4, 4/4 And 8/4 ) With Concept workshop, Playing Odd Metered Rhythms With Concept: Moving the “3”, setting yourself up for success, and how to Improvise, working with Turkish Roman 9’s as well as an "Open Clinic" Drum Workshop. Chas ran Introductory drumming workshops, Intro. 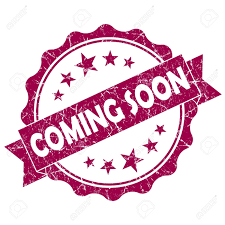 to Polyrhythm and constructing a Drum Solo workshop. Together Mark and Chas ran an Introduction To Long Metered And Muwashshah Rhythms workshop. 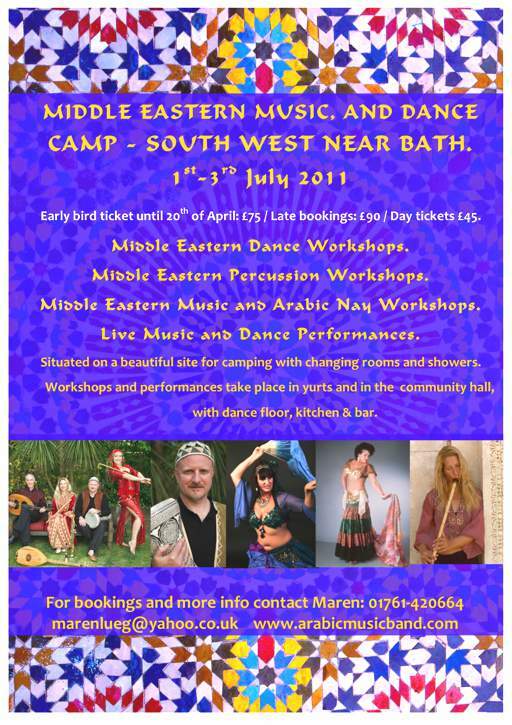 As well as her usual Introduction to Middle Eastern Music workshops and seminars, Maren also ran an Andalusian Muwashshah & Classic Arabic Instrumental Sammai workshop, Taqasim: Improvisation In Middle Eastern Music seminar as well as several Turkish and Arab Ney classes. Russell Harris was on hand to Introduce the Oud and Rebab. Carmen ran an Andalusian Muwashshah Dance Choreography for Lamabada Yathathana as well as a Drum Solo For Drummers And Dancers workshop with Chas. Local Tribal dancer Pearl Boheme ran a Tribal Fusion Workshop to Helm's music and Michelle Pender introduced her Combinations For Tribal Dance workshop. Sevilay Ataseven Turlington introduced the lyrics to several popular Turkish songs for our first ever singing workshops ably assisted with the musical talents of Simon Leach and Jo Levine. Performances were by Helm, Souk Bab el Louk and Mazaj. Our fourth festival had Alf Leyla Wa Leyla as the subject for the Themed workshops and the melody was taught by Maren, Rhythmic arrangement by Chas and Choreography by Juliana Brustik. We were joined again by the legendary Sheik Taha on Accordion for workshop assistance and performance. We also welcomed back Guy Schalom teaching Male Saiddi Stick Dance for all. Guy was joined by the wonderful Merlin Shepherd to introduce a Balkan / Near Eastern / Turkish component to the festival. Workshops included Klezmer Circle Dance, Intro. To Klezmer Music, Near East and Balkan Rhythms. Jane Wass returned for a workshop about dancing to Arabic Ney and Saxophone Taqsim as well as Ghawazee Dance. Carmen Jones shared her knowledge of Hot New Steps From Cairo and Russell Harris was on hand to Introduce the Oud and Rebab. Raheesha shared her knowledge on Turkish Roman Dance and Michelle Pender guided dancers through the subject of Dancing With Zills. Chas Introduced the common Rhythms Across the Middle East as well as the more unusual ones from N. Africa, Turkey and The Gulf Regions. Performances were by Souk Bab el Louk, Mazaj, Merlin Shepherd, Guy Schalom, Sheik Taha and a fantastic set of traditional Iranian and original tunes from Kooch with ever entertaining Sirus. There was also a great demonstration of the Hang Instrument by Barry Mason accompanied by Chas for a Middle Eastern Rhythmic fusion session. It’s been a long, cold, soggy summer. Rain, drizzle, fog and rain again. And then suddenly, against all odds, a bright spot develops in in a muddy field just south of Bath. Tents and marquees spring up, the Community Hall acquires sound systems, spotlights, and stalls full of goodies, plus a delightful café selling Moroccan style food. 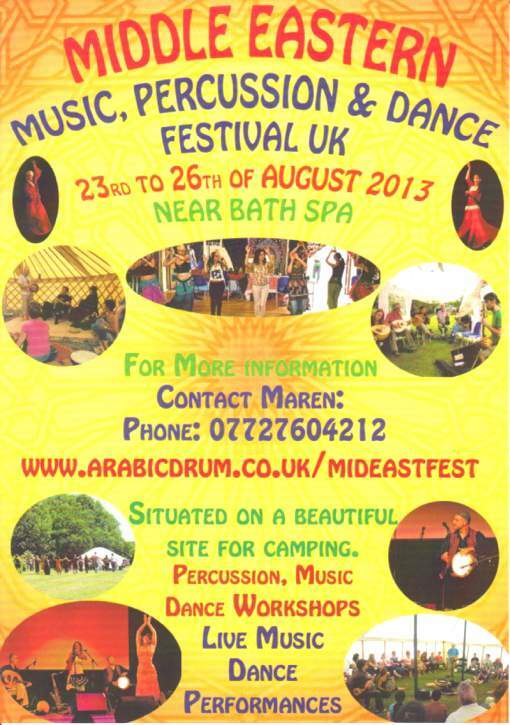 The Middle Music and Dance Festival is happening again. It’s in its third year, and this the second time I’ve been. As far as I can tell, it just keeps getting better. Numbers were down this year, due to the aforementioned soggy weather, but those who made the effort were in for a treat. Maren had, once again, assembled a crack team of dancers, drummers and musicians. This of course made deciding which of the workshops to attend a difficult choice. However, I had travelled there with two friends, so we split forces to cover as much ground as possible. Kate and Cath opted to find out more about the use of sagats with Michelle Pender, who had given a lively demonstration at the teachers’ showcase concert on the Friday night. I attended a seminar on the history of Middle Eastern music, which I found fascinating. Understanding more about a subject always increases my enjoyment of it. We all got together again for drumming with Chas, followed by something new to all three of us – Klezmar circle dancing, led by Guy Schalom. I hadn’t heard the name before, though some of the music has come my way. I love it already. Other workshops included Classic Egyptian dance with Juliana Brustik, Gahwazee with Jane Wass, and Turkish Rom with Raheesha. This last was danced on the bare ground in the marquee with much tapping of the feet – and up came the worms to see what was going on. We moved outside onto the grass for a combined drum and dance workshop with Chas and Carmen, followed by new steps from Cairo with Carmen – some useful moves and combinations we can take home and show to our friends. Finally it all came together in a big show-and-tell, with dancers, drummers and melody players all working together to demonstrate what we had learned. The shows were, of course, excellent. There was the Teachers’ Showcase on Friday, as already mentioned. Saturday night was music night, featuring, among other things, a virtuoso clarinet performance by Merlin Shepherd. Sunday night introduced a sadly reduced audience to the wonders of the hang drum and some very entertaining Iranian folk singing. And Sunday being the only remotely dry night, the drumming and singing round the camp fire continued into the early hours Monday morning. Some time later on Monday I arrived at my sister’s house damp, muddy and dishevelled, still wearing my festival wristband, and burbling of amazing music and wonderful dancing. She welcomed me with hot baths and cake, in true Middle Eastern style. I hope more of you will come to the festival next year. The weather is bound to be better. I feel moved to write about this wonderful festival that I attended last weekend just outside Bath. It was the first year I had managed to attend this event and I was not sure what it would be like or who would be there only I had a fair idea it would be well organised and I was not wrong. The thought of camping in this terrible weather of our UK summer was not appealing and my partner who I had hoped would accompany me and help make camp decided against it. I contacted the organisers who reassured me I would have help when I arrived was reassuring however, by the end of the week circumstances changed. I had just acquired a leg from the NHS designed so that I could run on it and I had (being me) gone running 3 times in the week prior and had a bad back and a sore leg. The decision was made to attend the event but come home to my bed each night, an approximate 50 minute drive. As I enjoy drumming as much as I enjoy dancing I knew that I would be spoiled for choice about how to spend my time and decided that because of the beating my leg had taken the previous week that I would indulge my passion for percussion. I arrived on the Friday night to see the opening show and the venue was not too hard to find, I was immediately met by some very efficient security stewards who helped me to park up and get my weekend ticket. The hall was so beautifully decorated by Michelle Pender, with gorgeous fabrics that totally transformed the space into something quite magical. The scene was set for a great night. The evening started off with a pleasant introduction of each of the teachers, including a talk and/ or demonstration of their arts which they would be subsequently sharing with the students. Russell Harris gave us a demonstration on his Saz and Rababa which was brilliant, so nice to hear the Rababa on it's own like that, it had quite a haunting sound. We were treated to some wonderful dance performances by Jane Wass, Juliana Brustik, Carmen Jones, Michelle Pender and Raheesha and the evening ended up with a Klezmer Circle dance led by Guy Schalom. It truly wet the appetite and driving home I was disappointed I was not camping because the atmosphere as I left was still going strong. When I returned on Saturday the food in the kitchen smelt wonderful and I started to wish I hadn't skipped breakfast but I had arrived for the break time and so I treated myself to a hot cup of tea and a slice of fruit cake. I then took the classical drumming workshop with Chas Whitaker and it was a real pleasure to study with him again after all this time. 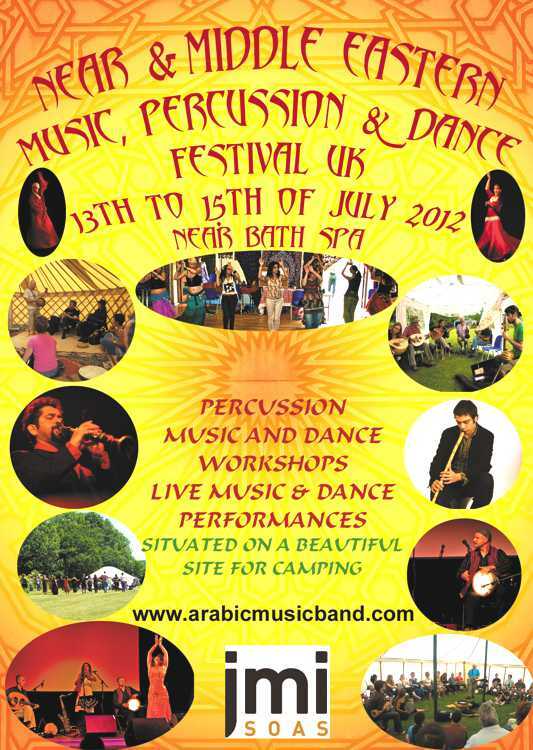 I had first taken a course in Arabic Percussion with Chas in 2005. I decided to play my new Somabti Darabuka acquired from Chas at Majma earlier in the year a thoroughly delightful instrument. We learned to play along to Alf Leyla Wa Leyla and we had an Accordion and an Oud in the workshop which was a fantastic experience. The workshop was absolutely packed and Chas was a very clear, patient and good at dealing with all the different levels of players. It was a great start to things and it was good to know that we would perform this piece for the dancers taking Juliana's classical dance workshop to the same classic song at the closing on Sunday afternoon. I couldn't wait. Lunch break came around and a delicious menu was available all freshly made to order, and I chose a panini, unfortunately the panini's being so popular meant a long queue developed as the machine cooking them was limited in how many it could do at one time. Fortunately there was a long enough break to ensure that everyone got their food and a good rest and the atmosphere was warm and relaxed despite this small hiccup. My second workshop was with Chas and we learned rhythms from the Arabian Gulf, North Africa and from the Magreb. I liked this, the rhythms had a funky swing to them which helped highlight the respect for 'space' in the music and how this makes or kills a rhythm. This let me on nicely to Guy Schalom's drumming workshop and he was teaching Balkan and Klezmer rhythms. He really was a great teacher and helped me to identify the 'magic ingredient' in what makes a good percussionist. This is a man who truly knows how to live in the moment and his wonderful energy was very inspiring indeed. He had all our inhibitions truly kicked out the door by the end as we clapped, sang and danced the Klezmer rhythm. I cannot get 'Ta-Ta - Ta-Ta - ta-ta-Ta-TAaa' out of my head now and feel sure it will not leave me. What a fantastic teacher he is and he has passed on to me a new passion for Klezmer and a strong desire to gatecrash a Jewish party. The timing and flow of the event was very relaxed and not at any time did I feel rushed or overwhelmed in any way and dinner time was perfectly timed. The food that I had smelled cooking upon my arrival finally transpired and it was absolutely delicious. Everyone was so relaxed and friendly that I soon had some great company to share my evening table with as the musicians prepared to entertain us all. The evening began with a hugely talented clarinet player, Merlin Shepherd, it was absolute magic. He worked with Guy Schalom and they were so inspiring together. Then if this wasn't enough the revered Sheik Taha joined them both and that's when the Baladi started. Well I absolutely COULD not stay in my seat once the first few notes on that accordion struck up that was it. I was the first one up on the dance floor and after a couple of minutes started to drag my mates up with me. Well that was it, after that, no one sat down again. Chas Whitaker joined in the party and between the 4 of them they made sitting any part of it out impossible!!! Heaven! There were lots of hot sweaty dancers and the bar was a welcome addition to the venue at this point for sure. Later in the evening Sheik Taha took a well earned rest and Mazaj took the stage and kept everyone up dancing. I left the event at midnight and things were still going strong then. It was hard to do, but I knew it would be gone 1 when I got in and I wanted to be sure I made the most of the classes the next day. Again I wished that I had been able to stay on site. Certainly nothing will stop me from doing so next year! I arrived back on camp on Sunday a bit too late to take part in the workshop before lunch, and as the sun was shining I sat outside with Mazaj's version of Alf Leyla Wa Leyla on my ipod and practised drumming along to it. I sat around and had some lovely conversations with a lot of very interesting people and learned a lot of new things. I then sat in on Jane Wass's Taqasim workshop and very much enjoyed the talk that Maren gave about the taqasim and its content and meaning. It was quite emotional and I was very inspired. After lunch I decided to drum for Raheesha's workshop Turkish Romany on the 9/8 rhythm and this was really good experience of being in a band because there were only 4 drummers including Guy Schalom and Merlin Shepherd on Clarinet, so I got the chance to be 'instrumental' in the proceedings which was really great. It allowed me to contribute a good steady clean rhythm with the quality of renewal each time which was part of Guy's teachings from the previous day. It also allowed me to work with dancers which was brilliant. The workshop I took then was the Klezmer for musicians and percussionists, led by Merlin Shepherd and Guy Schalom and we worked out a whole piece to play for the final performance. It was quite magical. I decided to play my very large Remo frame drum that Anna Chandler had bought for me whilst I was recovering in hospital after my accident in 2007. This was symbolic of my recovery and everyone fell in love with the sound. Especially Merlin Shepherd who decided to make it a key feature of the Klezmer opening and finish. I felt deeply responsible and honoured. The festival culminated with everyone getting together and playing their pieces, musicians, drummers and dancers all together. I was very inspired to see some very young musicians taking part and I was quite surprised at how many drummers there were. I decided to play my frame drum for both pieces because there were so many darabukas and I managed to attract quite a few dancers hips to move with my earthy bass notes during Alf Leyla Wa Leyla which was great. The Klezmer piece was brilliant and included singing and vocals and it was very moving to see Merlin brought to tears by it at the end. I left the festival feeling like I had not only had a wonderful experience taking part, but I had also learned a lot about music and how it really brings us all together. I have a more developed 'ear' for the subtlety of creating music and working with others to truly contribute to the overall piece. In fact I awoke in the very early hours of Monday morning to bird song, which I never normally do, and I felt compelled to 'tune in' and listen to the individuals of the chorus. It was a profound moment and a real testament to the value of the weekend. I shall definitely make it a MUST in my annual calendar and highly recommend it to others as well. 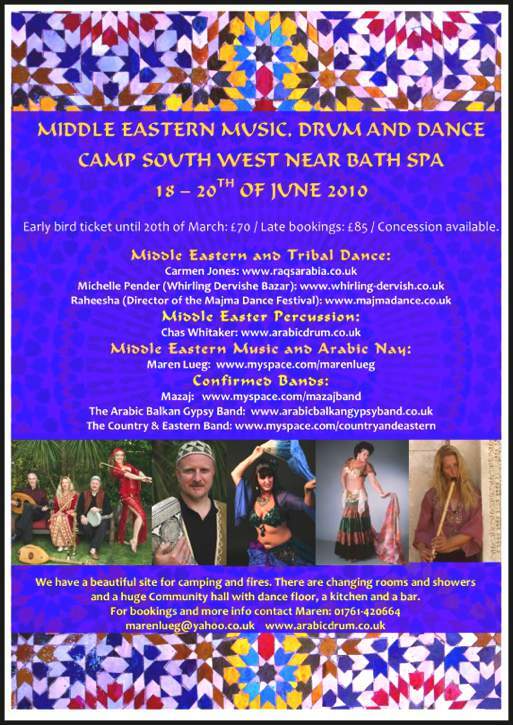 Our third festival had a BALADI theme and included Guy Schalom, Sheik Taha, Jane Wass, Maren Lueg, Chas Whitaker, Carmen Jones, Michelle Pender, Raheesha, Bland Mahdi and Russell Harris teaching. Performances were by Souk Bab el Louk, Mazaj, Jon Sterckx's Drumscapes, Murat Ferhat Yegul, and Nectorian. This was our second festival and first at our Camerton site with Maren Lueg, Chas Whitaker, Carmen Jones, Michelle Pender, Raheesha and Bland Mahdi teaching. 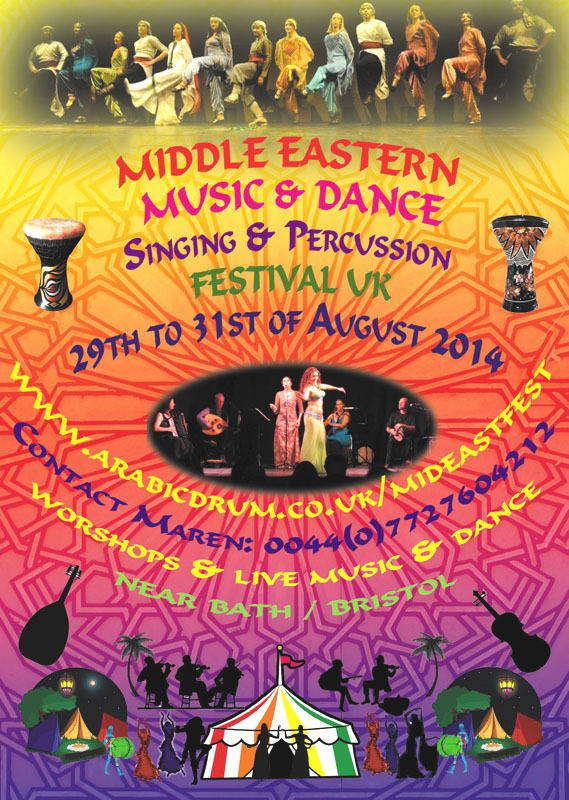 Performances were by The Country and Eastern Band, The Arabic Balkan Gypsy Band and Mazaj. 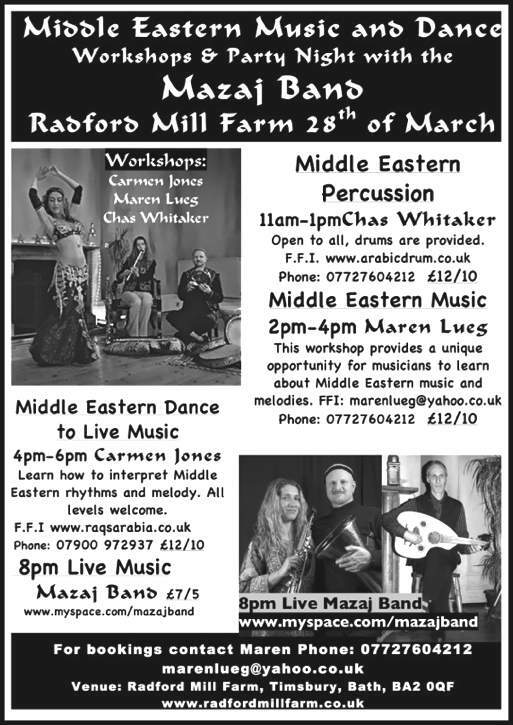 This was our first festival at Radford Mill Farm with Maren Lueg, Chas Whitaker, Carmen Jones.